THERE are already signs of significant progress in the massive $66 million project to transform an abandoned Masters hardware store into a repair and maintenance hub for fighter jet and tank engines from across the globe. Ipswich is set to be the epicentre of the action when it comes to keeping 3500 of the world's F-35 Joint Strike Fighters up in the air. 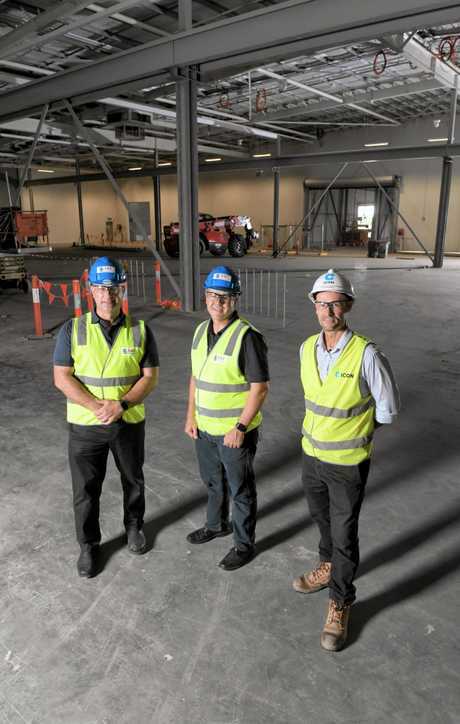 Having purchased the former Masters site for $12.5 million last year, TAE Aerospace has teamed up with contractor Icon Construction to refurbish and modify the warehouse and create a second building where the car park used to be. When the building is ready to hand over to TAE at the end of the year, it will boast two massive warehouses at either end that will house parts for the Super Hornet, Abrams Tank and F-35 Joint Strike Fighter, plus an enormous central repair area containing four 3.5m deep pits where the engines weighing up to 2700kg can be craned in for stripping down and reassembling. The finished product will also contain offices for engine manufacturer Pratt and Whitney -who are TAE Aerospace's main client - and break-out areas for TAE maintenance staff. Icon project manager Angus Walker said construction was on track, with about one quarter of the job done. TAE Aerospace will begin fitting out parts of the new facility in as little as two months. "We have already extended the end of the building to create two new warehouses," Mr Walker said. "We have upgraded the internal structures to accommodate the 17 overhead cranes, which will pick up engines weighing about 6000 pounds." 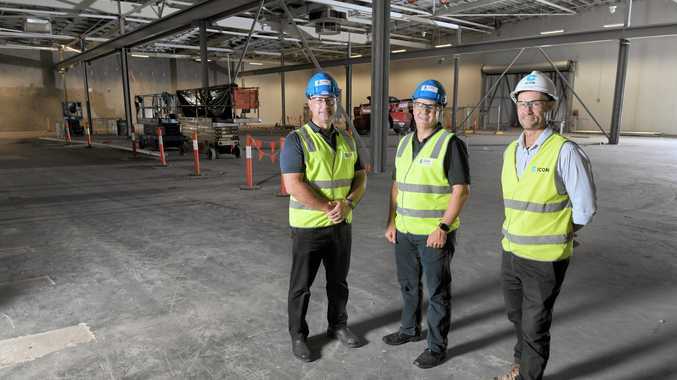 The former tradie's area has had the roof raised 2m and the floor ripped up and concreted again so that it can become the F-35 warehouse for the entire Asia-Pacific region. TAE Aerospace CEO Andrew Sanderson said if anyone needed parts for the Joint Strike Fighter in the region, it would come from the new Bundamba site. Mr Sanderson said TAE Aerospace would also increase its current Amberley workforce of 140 to 160 by the end of the year, and 200 after that. "The first engines we will work on here will come from the US Marine Corps, because ours here in Australia should not have any issues for quite some time," he said. "Ultimately we will be running a double shift in the maintenance area." TAE will maintain its engine test cell at Amberley RAAF base, upgrading it to cope with the Joint Strike Fighter power plant, which packs 43,000 pounds of thrust, weighs three times as much and is one and a half times the length of the Super Hornet engine. That in itself is a $22 million project. 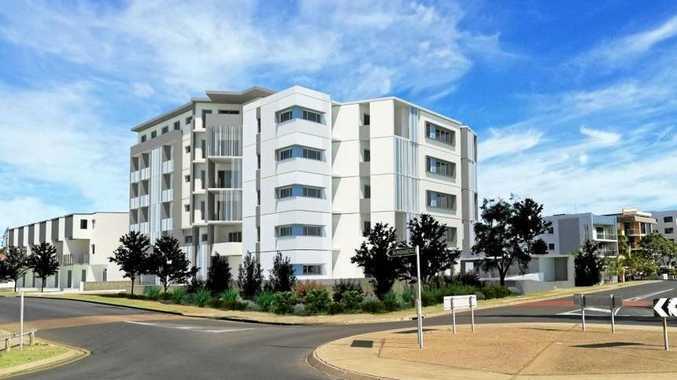 In his first Bundamba site visit for a month, Mr Sanderson said he was excited about the progress. "We have had good engagement with Icon throughout and we are very happy with how it is progressing," he said. 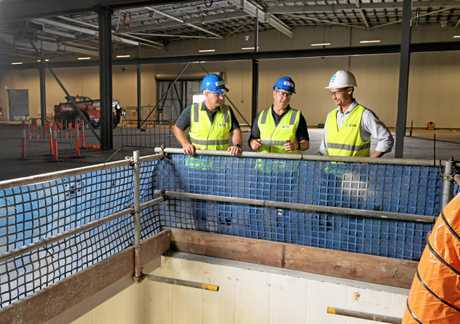 "The opportunity to purchase this site came just at the right time and it has saved us about nine months of construction time by doing it this way." Construction is set to be complete by the end of 2019.